Seeing double on a Google Search Engine Result Page (SERP) is not a glitch…it is actually a very good thing. 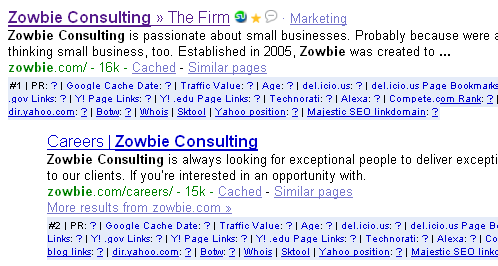 When a site displays twice on a SERP we call the instance “indents” or “double listings”. Site architecture and link strategies are what produce these double listings. Not the best example of nich saturation, but a good example of a double listing. It isn’t good enough just being #1, or #2, or numbers 1-3 for a specific search phrase in your given niche…you must strive to achieve niche saturation. Niche saturation is about displacing your competition. It’s about creating the illusion of greater choice to searchers and funneling money to your pocket. How did this happen? You need to have 2 relevant pages. Both pages need to have keywords in the title. 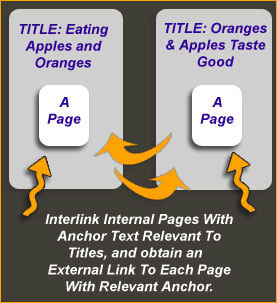 Then interlink each page with relevant anchor-text containing those keywords. Be sure the Titles aren’t identical and then use a “feeder” site to gain an external link to each of the pages with the appropriate anchor text. Use keywords in your title and link to them heavily within your site/blog. Then whenever you write a follow-up article the appropriate posts will already be interlinked with the other as long as your titles are common (not identical). As far as the “feeder” – just use a site already in your control that matches in relevance (or find a relevant forum) – this can be in industry or geography (better if both). Also, use a different domain while trying to saturate, you only get a single indent per domain.